What can I send to Switzerland? What items are restricted? If sending to a ski resort please visit our ski shipping page for further information. As skiing is one of the most popular activities in Switzerland, many travellers want to take their own skiing equipment with them to Switzerland. Yet, they often find that their baggage is not included within their airline’s baggage limits and that they are often charged a hefty fee. Send My Bag’s luggage delivery service takes the hassle out of travelling with heavy or bulky items because we pick up your items from your home and deliver them to your destination quickly and safely. Our service is also great for those who have multiple transfers during their journey and who do not want to cart their main luggage around with them. Students who are relocating and groups travelling together also find our service to be a godsend, freeing them up to travel light and hassle free. You can send your luggage and boxes to Switzerland with Send My Bag. If you are going skiing in Switzerland, if you have a temporary work contract there, or if you are moving there permanently, you can save yourself a lot of hassle by sending your possessions with Send My Bag. This will allow you to bring lots of your home comforts to make Switzerland feel a bit more like home. With your possessions taken care of, you can get on with exploring your new surroundings. Send My Bag has a large number of international routes, with fabulous rates for each route up to a massive 30 kg. To learn more about sending luggage to Switzerland, take a look at our ‘How it works’ page, or our ‘FAQs’. Switzerland is not only popular as a ski destination; it also has lots of great golf clubs to choose from, such as Domaine Imperial, Lausanne and Crans-sur-Sierre. It's easy to send golf clubs to Switzerland with Send My Bag. This will make your journey to Switzerland much easier, since you won’t have to drag large golf bags behind you. You will also avoid any oversized baggage fees from your airline. It is so much more enjoyable being able to play golf using your own golf clubs, rather than borrowing some, so consider sending your golf clubs with Send My Bag. Make sure you find out how best to parcel up your golf clubs by reading Send My Bag's information on how to send golf clubs. 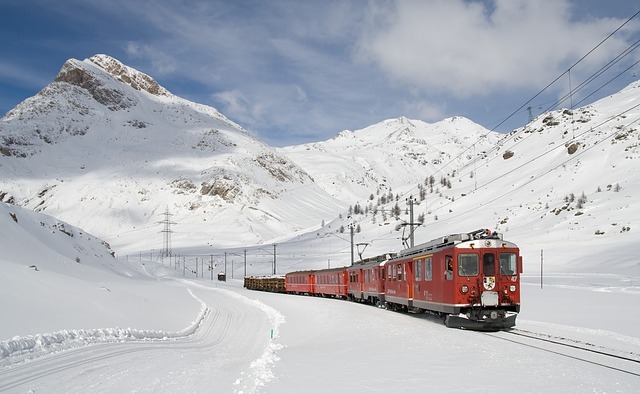 Switzerland boasts numerous ski resorts, such as Verbier, St. Moritz and Davos. If you send your own skis with Send My Bag you won’t need to use rented skis when you are there. It is easy to send your skis, just make sure they are packaged up well and visit Send My Bag to find out how to send your skis to Switzerland. Check out our ski shipping information to learn about how to package your skis for transit, safely and in line with regulations. If you moving to Switzerland permanently, or for a year or two of work placements, you will have to look into international removals to Switzerland in order to transport all of your possessions. Before you have the movers pick up your items, ensure that everything is carefully packaged so it won’t get damaged in transit. Use suitable packaging for your items and seal everything up well. You can send all the things you need to set up home in your student accommocation in Switzerland with Send My Bag. You can send books, textbooks, clothes and DVDs to create a home from home. It's easy to send your things to Switzerland. Take a look at our student removals page and find out how to get 10% student discount. You can easily send a parcel to Switzerland with Send My Bag. Friends and family can use this option to send you care packages or gifts throughout the year. Or if you have left something at home, they can pop it in a box for you and send it to you in Switzerland. Send My Bag can send parcels internationally to Switzerland for you. Make sure you use a suitable, sturdy box when sending a parcel to Switzerland and tape it up well so nothing gets damaged in transit. Also make yourself aware of rules relating to personal effects and brand new items (see below). Take a look at our information on how to send a parcel to find out what you can send with Send My Bag and how to package your items. One option for sending large items to Switzerland is air freight. Transit time for air freight is usually one to two days. It is a speedy option but it can be expensive. The amount you pay depends on your shipment’s weight and its size. You will probably also have to hire a customs agent to deal with customs clearance for you. And, you need to get your items to and from the airport. Costs could, therefore, quickly spiral. If you send internationally by air freight to Switzerland your items will likely arrive at one of the major airports, such as Basel Airport, Geneva Airport or Bern Airport. You could choose sea freight or container shipping to transport your possessions to Switzerland. If you don’t need your items immediately, this could be the option for you, especially if you need to send something like a dining table or a car. This option can be less expensive than air freight, but you will still need to hire a customs agent and will need to get your items to and from the ports. So, the cost could be more than expected. As Switzerland is a land-locked country, your items will most likely arrive at one of the major sea ports in neighbouring countries, such as the Port of Genoa or the Port of Venice, in Italy. I would recommend this service and will use it myself again. One area of improvement is for DHL to provide a shorter pickup timeframe, not the general 9am to 6pm. Other than that... it is really good. The majority of shipments entering Switzerland clear customs within 1 working day. Customs authorities may however select shipments for further inspection and will typically take 4-5 working days to complete this process. The majority of Send My Bag shipments worldwide will not be stopped by customs, given that most countries allow a significant number of personal effects to be shipped free of charge. Personal effects are considered to be used items that have been in the sender’s possession for at least 6 months. New items in their packaging will not necessarily be considered as personal effects, even if you bought them for your own use. If your bag is checked by Swiss customs and is found to contain brand new or commercial items, your shipment may be assessed for customs duties and taxes. If you are sending Christmas gifts to Switzerland please check with the destination country so you are aware of potential customs duties, follow their advice and attach all necessary documentation. Customs processes and regulations are different depending on the country. We, therefore, advise all travellers to take 5 minutes to check how their personal circumstances and what they are sending will be assessed under the prevailing customs regulations in Switzerland. You can find out more at Send My Bag’s customs information page. In order to demonstrate to customs that you are sending personal effects, you will be required to complete a brief non generic packing list online, entries to be made in the format: "7 x Pairs of Socks, 1 x Pairs of Shoes, 2 x Denim Jacket" and so on rather than as "10 x Used Clothing". When a bag is stopped by customs for any reason (missing documentation, prohibited contents, commercial contents or further information required) Send My Bag™ records how long customs hold it for. Our historical statistics for this route indicate that if the customs authority stops your bag they will on average take 1 days to process it and release it back to us for delivery. Switzerland has a plethora of fascinating cities to discover, including the historical capital Bern, Geneva with its rich art and culture and the major business hub of Zurich. All these cities offer a glimpse into the history and culture of the country, coupled with modern day life. Although Switzerland has many amazing cities, the main draw for tourists is its mountain ranges. The Swiss Alps are one of the most popular destinations for adventure seekers in Europe and they offer a wide range of activities, including skiing and snowboarding, hiking, cycling and general sightseeing. There is no official Swiss language, although Switzerland does have four languages that are considered official; these are Swiss-German, French, Italian and Romansh. Due to its major worldwide business ties, many Swiss people speak English as a second language, so you will have no problem finding English-speaking people, especially in larger cities and tourist hotspots. Swiss cuisine has many regional influences, including French, German and Italian cuisine, although Switzerland is particularly famous for its cheese and chocolate. Cervelat, a type of sausage containing a mixture of bacon, beef and pork rind is considered the national sausage and is a popular choice all across the country. By far the biggest attraction in Switzerland is the mountain ranges where you can ski, snowboard, hike and cycle along the breath-taking scenery of the Swiss Alps. For those who want to do some more leisurely exploring, the larger cities offer a wide range of shopping opportunities and plenty of other entertainment to keep you occupied.